Black Diamond cured concrete cutting diamond blades have been tried and tested in the toughest conditions. The cured concrete cutting laser welded diamond segments are 10mm in height. 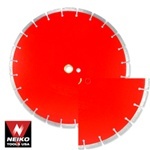 This gives the diamond blades for cutting cured concrete a distinct advantage over the competition because of its wet or dry usage. The blade can also be used to cut pavers, bricks, block, concrete, clay tile, concrete pipe and many other concrete based materials.